In an increasingly human dominated world, in an epoch called the anthropocene, nonhuman animals (animals) are suffering greater than ever before. The anthropocene is also called "the age of humanity," but I like to call it the "rage of humanity." Numerous people can help other animals, not only academics including biologists, conservation psychologists, sociologists,and anthrozoologists, for example, but also photographers and nature writers who are able to reach a broad, wide-ranging audience. A new inspiring book called Grizzlies of Pilgrim Creek, the most famous bear on earth, American grizzly 399, is igniting a national conversation. You need to read this story. At hand is the question, "Should America's iconic grizzly bears in Yellowstone and Grand Teton be put in the cross-hairs of trophy hunters if they cross outside the invisible national park boundaries?" Should we be "sport hunting" grizzlies at all? Grizzlies of Pilgrim Creek tells the story of 399 and her extended family of bears. I've never seen another book like it. What few readers may realize is that Greater Yellowstone's grizzly population doesn't belong to the federal government. These popular bruins belong to all Americans. And we need to take action to protect them. Recently, I sat down with Tom Mangelsen and Todd Wilkinson to ask them about the book and the controversial topic it addresses, namely, the federal government's proposal to remove Greater Yellowstone grizzlies from federal protection under the Endangered Species Act and to open the door to these bears being hunted for sport, which means hunted for fun. Marc Bekoff (MB): Who is Grizzly 399? Thomas D. Mangelsen (TM): She is a 20-year-old grizzly mother who weighs about 400 pounds and stands about seven feet tall on her hind legs. She makes her home in Grand Teton National Park just south of Yellowstone. Over the years, some 15 offspring (cubs and cubs of cubs) are descended from her. She also has a famous daughter known as research bear 610. Soberingly, over half of 399's brood have already died in various kinds of negative run-ins with humans. MB: Grizzlies of Pilgrim Creek, your new critically-acclaimed book, has been getting a lot of attention. It has really put Grizzly 399 on the map of international public discussion. I've been told that even policymakers in Washington DC are reading it. Todd Wilkinson (TW): I've been writing about grizzlies for 30 years and I've never found a group of bears that provide a better window into understanding the profound challenges of survival greeting grizzlies in the modern world. I wanted the narrative to show the life and death interactions of both bears and people. What's really breathtaking are Tom Mangelsen's photos. He's spent the equivalent to two years during the last decade documenting 399 and her cubs. That's what makes these photos unprecedented. TM: Besides being a charismatic grizzly, 399 is really a poster child for the controversy surrounding whether federal protections for the Greater Yellowstone bear population should be lifted and whether bears should be subjected to trophy sport hunting. MB: And what do you think? TM: There is a lot of compelling evidence showing that removing grizzlies from safeguards under the Endangered Species Act and giving states control is unwarranted and premature. I,and many others, including your good friend and mine,Jane Goodall, find the notion of recovering the country's most iconic grizzly population in order to turn around and kill bears for sport to be repugnant. Millions of people enjoy watching grizzlies like 399 live. To shoot them so that a few individuals can be shot dead and turned into rugs and trophy heads on the wall is disgusting. We owe these bears more. I have a serious problem with those who are motivated by the thrill of killing wolves, cougars and especially Yellowstone-area grizzlies for "fun and sport." People don't eat grizzly bear meat. Grizzlies are highly intelligent and sentient creatures. They have emotions, feel pain, and are incredibly social and dependent on their mothers for survival for several years after they are born. MB: What about the science of delisting grizzlies? Don't available scientific data support protecting, rather than delisting them? TW: A number of prominent independent scientists have expressed serious concerns about the loss of key grizzly bear foods, some of it exacerbated by climate change, and how that might be affecting fertility rates and causing bears to roam further in the ecosystem where they are coming into lethal contact with elk hunters and livestock. The National Park Service has weighed in saying transboundary grizzlies that spend most of their lives in the national parks shouldn't be subjected to hunting in the states when they cross park lines, but Park Service demands have largely fallen upon deaf ears by the U. S. Fish and Wildlife Service. Critics say the push to delist grizzlies is being driven by politics, just as politics were recently identified by a federal judge in a case involving wolverines. The Fish and Wildlife Service was ridiculed for ignoring science that undermined its arguments. Recently, Jane Goodall issued this video opposing delisting and hunting Greater Yellowstone grizzlies. MB: 399 has been likened to America's version of Cecil the African lion. TM: That's right and fortunately she hasn't been killed by poachers or big game hunters. But like Cecil, she is a transboundary animal. 399 lives much of the year inside Grand Teton National Park and dens in the adjacent national forest. In the fall she follows the sound of gunshots and the smell of gut piles left behind by deer and elk hunters in the national forest. It's hugely risky. MB: Some people in Wyoming have said if sport hunting of grizzlies begins again, they intend to specifically target 399 because she has such a high profile. 399 is a bear who gives a lot of people joy in seeing her. But there are folks who want to kill her because they hate grizzlies, they hate the Endangered Species Act, and they hate environmentalists trying to protect bears. MB: Let's switch gears a bit. 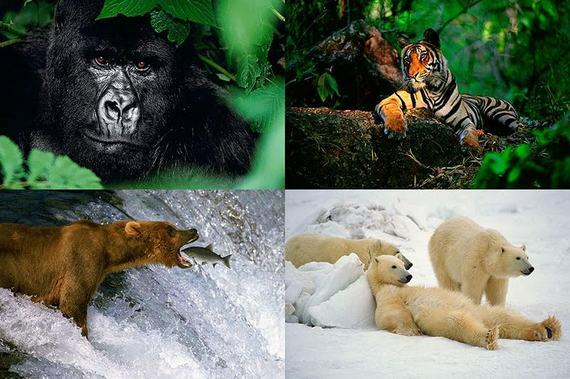 Some of your wildlife images, Tom, have been counted among the best photographs of all time. Last year, a book of yours called The Last Great Wild Places won a national outdoor book award. I've always felt that images of wild animals could be incredibly influential for exposing people to the fascinating animals with whom we share our magnificent planet, especially people who are unable to meet these animals up close and personal. What did you think. TM: I agree. The Last Great Wild Places was a compilation of my favorite photographs taken over the last 40 years and I'm enormously pleased by the public response the book has received. Animals like polar bears, tigers, African lions, elephants and gorillas face dim prospects for survival the deeper we get into this century. Apathy is not an acceptable response. Humankind needs to take action to save them now. MB: Your limited-edition photographs are collected as fine art objects and the list of people who hang your images on their walls is pretty impressive. It includes major corporate CEOs, politicians and celebrities, but I've been told you try to make your work affordable for everyone. TM: One of the nature photographers who inspired me was Ansel Adams who pioneered high-end collectible photography. Adams took great delight that his nature photography helped to popularize modern wildlife conservation. Collectors often tell me, 'I buy your photographs because I can hang them on the wall and they reflect my own love for the natural world.' If I can help collectors bring wildness into their hearts and living spaces, I consider my mission a success. MB: What kind of impact has Grizzlies of Pilgrim Creek had? TW: In late April, I moderated a panel about bears, wolves and the Endangered Species Act in Washington D. C. The event was held in the U. S. Capitol and sponsored by members of the House Natural Resources Committee. Tom showed images of bears and testified. The story of 399 is igniting a national conversation that hasn't existed before. MB: The book has received praise from Jane Goodall, Tom Brokaw, Ted Turner, and Yvon Chouinard, founder of Patagonia clothing company. 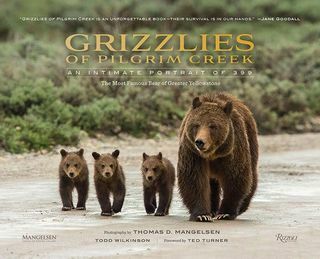 Several reviewers have said Grizzlies of Pilgrim Creek is a necessary primer for people who are headed to Yellowstone, Grand Teton and Jackson Hole on their summer vacations and hope to see bears. And what about youngsters? TM: We hope so. It's a powerful thing to see travelers, especially kids, get animated when they see 399 and the other grizzlies in Greater Yellowstone. Parents tell me that having the opportunity to see bears with their kids changed their lives and made their vacations. These kinds of things are powerful cures for things like nature-deficit disorder in young people. MB: Todd, what's a message you want readers to take home? TW: That Americans realize grizzlies and the federal public lands that bears inhabit belong to them. Most citizens aren't even aware of this. Whether you live in the city or countryside and no matter what your cultural background is, you have a rightful say in the future of grizzlies. It's important that you get involved. MB: How can people learn more and where can they get the book? TM: We’ve set up an informational page about grizzly 399 and grizzly bear conservation here. If Huffington Post readers use the code PCAUTO they can buy books autographed by both Todd and I and receive free shipping. MB: Tom, what do you hope to accomplish with the book? TM: The book will leave people smarter about grizzlies and hopefully inspire them. It certainly makes clear that the irrational fear people have for grizzlies is unfounded. Humans can co-exist with grizzlies. The question is, "What are we willing to do to keep bears alive and insure they will be enjoyed by future generations?" The plight of grizzly bears is only one among many in which nonhumans suffer in an increasingly human dominated world. Conservation psychologists and anthrozoologists can play an important role in protecting other animals and books that contain fact-tilled text along with wonderful photos of the animals also are instrumental in changing people's heads and hearts. I feel privileged to have been able to have had this discussion and I hope that others feel the same. You can sign petitions here, here, and here.